I’ve had the Twenty Seventeen template by WordPress for too long, its header picture started to annoy me 🙂 … Editor by Array had caught my eye today, mainly because of its typeface and styles (see Style Guide). The new template almost feels like a new start point. Hopefully, this new template will keep me more focused and motivate me to write more. I’m doing some Project Euler problems to brush up my coding skills – see if I still have got it. Just like riding a bicycle years later, I think years of training in the past had not left me yet. Just like cleaning up and oiling the old bicycle, I found myself trying to setup the coding environment again. It’s been a few years since I’ve used my Azure Virtual Machines (VM) that were setup for coding. Most of the resources were in the classic pools. First thing first, start up the VMs one by one to see if the logins are still working. Do not start them all in case the account notifications go crazy – they are not free! I deleted the VMs that I could not logon and created some with the latest products such as Visual Studio 2017 and Windows 10. I’m impressed with the variety of Azure VM template options – there is the popular WordPress and even Linux operating systems. The new, compare to the classic, version of the Azure dashboard takes a bit of time to get used to. The dashboard options can be a bit overwhelming to a user who is unfamiliar with the tools. One can always switch to the classic dashboard if unsure. There are some options that only exist in the classic dashboard, e.g. move subscriptions between Azure Active Directories (AAD). I had one subscription transferred from an old email. I created a new AAD and put all my subscription under it as a way of centralise all accounts and controls for my Azure resources. I am giving WordPress.com a try. Why, you ask? That was my 2 seconds rant to the rest of the internet because the target audience does not care to listen. Yay! This is my first post! 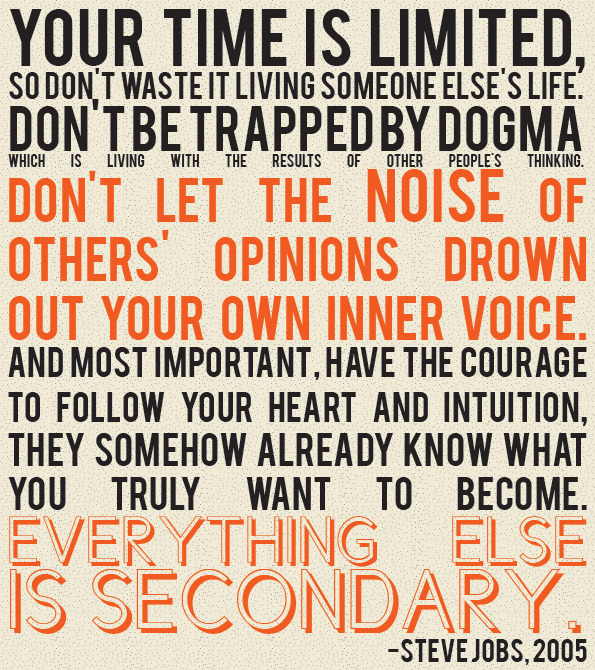 I close my first blog post with this quotes by my favourite human, Steve Jobs. Chinese has a saying – 天时地利人和. I believe that Steve Jobs’s success was not because of luck or any other external environmental factors but because of his vision, hard work, and being himself. I feel that these quotes reflect that. Be yourself and work hard! I hope that you will visit my blog often and leave a comment or two. Don’t be shy, the internet was originally created for collaboration not those social network.